If you made it to the bottom of my new year post, you might have seen my resolutions. Top of that list was declutter. Properly declutter. As in simplify life. After a lovely afternoon with some of my favourite ladies, one of them sent me the link to a year long project about simplifying life. A 2013 in 2013 declutter challenge. I'm not going to formally participate using their forum, but I am going to record my progress here. Coincidentally, I had already taken the first step and this lot has already gone to the charity shop. 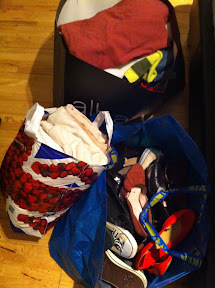 Yes, that is an Ikea bag full of shoes. I'm not exactly sure how many items were in those bags but I think I will count it as 50. I will update my tally throughout the year. (and might even list what I have got rid of - these bags contain shoes, clothes and sheets. We also took Delilah's unused cat basket to the vet for them to use for rescue cats or in their hospital). I am making an effort to simplify the things I do have, so investing in one nice and beautiful item and having only one, getting rid of the others. So far, Marto has bought me a beautiful Stella McCartney bra for my birthday now that I have stopped breastfeeding. We went to a lovely lingerie boutique and had it properly fitted, which was a treat in itself. I then am going to get rid of all my other ill fitting but I kept them anyway because I didn't have anything else to wear bras. I just need the baby to stop teething and settle to sleep properly so that I have a moment to do that! So far as my other resolutions are going, My birthday money has been partly spent on some beautiful items to try and assist with three of my resolutions (go to bed earlier, read more, Internet less). I am attempting to make our bedroom a really inviting relaxing space where bedtime will be 10pm. I have bought new (sale) pyjamas, am decluttering the room, have put all my Christmas and birthday books in a pile by my bedside to read and we have managed to get into bed with tea and our book several times already this year. Lastly, I am attempting to stop procrastinating and actually do things. This morning I changed the address on my vogue subscription. A small thing, but it's been on my mental to do list since we moved last March.